BRIDGEPORT, Conn. – “Noble,” Archbishop William E. Lori’s pet golden retriever, wasn’t at all happy about being in the spotlight during a recent spring visit with a journalist and photographer at the archbishop’s former residence in Connecticut. As the archbishop vainly tried to entice the 6-year-old canine to sit still for a photo, the long-haired pooch wouldn’t even be tempted by a piece of apple – a special treat. “He’s camera shy,” the archbishop said, squatting down to wrap a comforting arm around the dog before it skirted away and shook his head from side to side at the mere sight of a camera. 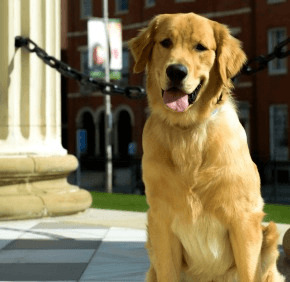 Noble may be in store for a higher profile in the Archdiocese of Baltimore – the nation’s first diocese and the “Premier See.” The dog accompanied Archbishop Lori to Baltimore and will be living with the archbishop at his Charles Street residence adjoined to the Basilica of the National Shrine of the Assumption of the Blessed Virgin Mary – the first cathedral in the United States. In Bridgeport, Archbishop Lori said, Noble was accustomed to the “country life,” enjoying a few acres to roam around and chase Canada geese off the property. There will be a much more urban feel in Charm City. Noble has already gone through a big transition. His littermate, “Barnes,” died Dec. 7, 2011. “Barnes” and “Noble” were named in honor of their master’s passion for reading. Archbishop Lori said he loves playing with Noble. The dog is his “constant companion” whenever the archbishop is at home, he said. “He’s a great dog,” the archbishop said, glancing down at his four-footed friend. As if on cue, Noble stood by his master’s side.